I miscalculated the time difference between Thailand and Myanmar which made me very, very early for my 5.30pm bus bound for Mandalay. I decided to go from my last pagoda stop, Kyautawgyi, directly to the bus station at the outskirts of Yangon by 4pm (as it turned out, it was just 3.30). A Buster Leaton feature was being rerun on the cable feed. 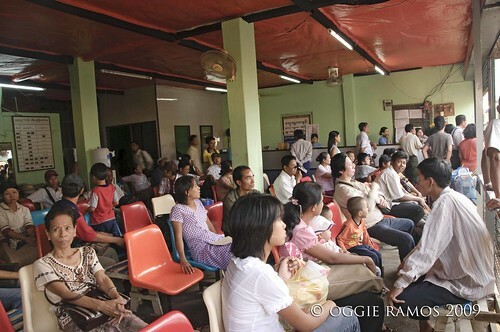 The Burmese crowd may understand little English but the physical comedy wasn't lost on them on the account of loud guffaws and giggles in all the right moments. Then, there's a corner store manned by a friendly couple from where I bought some snacks. I probably aroused the hubby's curiosity when I brought out the camera to take some photos of the crowded station because afterwards, he seems delighted with the images I took earlier in the day, nodding his approval and pointing them out to friends. Nearby, I espy a novice monk chatting away on his mobile phone. A curiosity alright but come to think of it, Buddhism may have been thousands of years old but it certainly isn't going to be left behind by technology. All these leads me into thinking I may be far away from home but I find kinship in our Southeast Asian brothers. Our bus arrives before 5.30 and after the traditional rites (lighting of incense and laying of leaves on the windshield for a safe journey), we were on our way. Another curiosity: we were each given a free set of toothbrush, toothpaste and candies (on another bus, we even got a bottle of mineral water), all to make the long journey as pleasant as possible. Exhaustion caught up with me as we rode, literally, into the Yangon sunset. It's a 12-hour trip to Mandalay and I intend to spend most of the overnighter in slumber. Note: I got lucky to get tickets as soon as I inquired from the fourth bus ticket outlet we approached.I t would be best to book a day at least or two in advance especially when a public holiday like the recent water festival is in full swing. There are bus ticket outlets near the Bogyoke market; inquire from locals about their whereabouts. 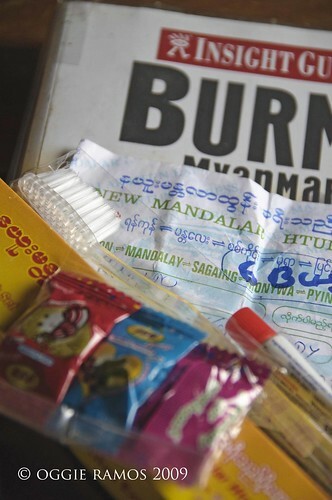 There are several bus companies that ply the Yangon-Mandalay route with fares ranging from 12,000-16,500kyats (roughly $12-16.5); however, some of the buses are intended for the locals only. it was a long trip indeed but looking at your photos, i am sure it was well worth it. have a nice day oggie. sayang, i missed the chance of meeting you and ferdz at the dot/mtv meeting. oh my. i can't even ride a bus here in pinas, what more in other countries. wow! better early than late. nice experience in that part of your journey bai. talagang parang kasama talaga kami sa byahe. 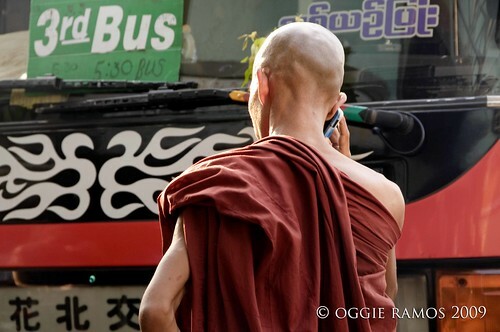 that's really cool to see monks having cellphone now. oman, i heard you were out of the country at the time. di bale, there would be other opportunities. reena, thanks for dropping by. i'm a backpacking photographer, which is why i was there.